In this month’s issue, I present a study I conducted at the Kegel Training Center in February 2011 to measure the impact of a two-tiered pre-shot routine on shot consistency. The two-tiered process includes an elongated breathing technique and an effective and proven targeting process. This complete process was designed after a review of research on psychophysiology, which is the study of the interrelationship between the physiological responses and psychological aspects of a player. With the pre-shot breathing protocol added, C.A.T.S. revealed a significant improvement in a bowler’s ability to execute more consistent shots. 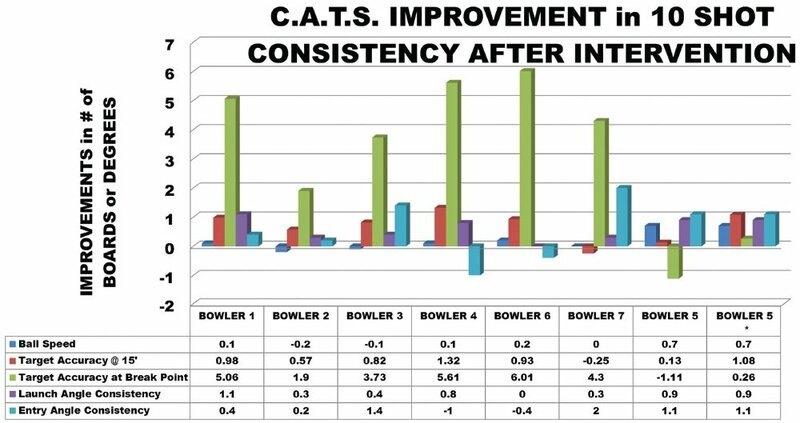 Specifically, six of seven bowlers in the study improved their breakpoint consistency by an average of 4.4 boards over ten shots. Three of the bowlers improved their consistency by over five boards. Six of the seven study participants improved their accuracy in the front part of the lane as well, with an average improvement in consistency of .79 boards at 15 feet. Finally, five of the bowlers improved or equaled their speed consistency, suggesting that the adding breathing technique helped to reduce body and hand tension as well as grip pressure. From a literature review on psychophysiology, we can see significant differences in the breathing patterns and body tension of elite athletes as compared with both experienced athletes and novices. These differences comprise heart rate deceleration, heart beat averages, and body tension levels. To illustrate, Table 1 presents the findings of a study of the breathing patterns of golfers of varying abilities and experience. In this research, Neumann and Thomas (2009) explored the relationship of the respiratory system on peak performance in golf putting. 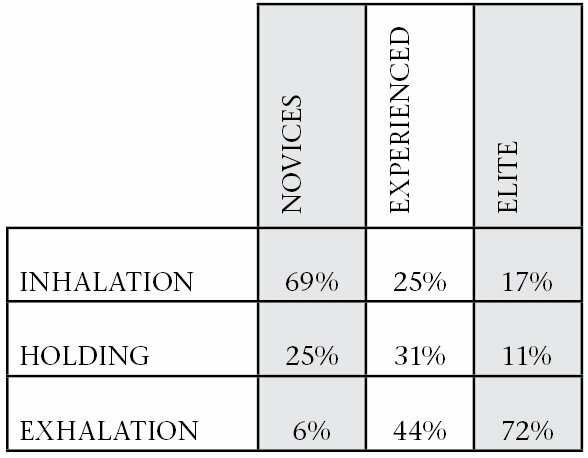 From the study, it was revealed that the breathing pattern of elite golfers is different than experienced and novice golfers. As the table data demonstrates, breathing patterns were substantially different between the elite and other golfers. 72 percent of elite golfers exhibited exhalation patterns that indicated heart rate deceleration started sooner and was greatest at the point of contact with the ball. The overall heart rate of the elite golfers (mean/average beats per minute) was less than the novices or experienced golfers. Heart rate deceleration has also been linked to tennis performance quality. Carlstedt (2001) studied the relationship of heart rate deceleration and the performance of an elite tennis player. During a winning match, in which the player won 6-4, 6-1, there were 283 decelerating heartbeat intervals preceding 51 action phases (5.55 decelerations per pre-action). Compare this with 112 decelerations prior to 27 action phases in a losing set of 6-0, 6-1 (4.15 decelerations per pre-action). Clearly, the tennis player had more heart rate deceleration in the winning effort. In addition to breathing differences, elite world-class athletes have less physical tension when executing in their sport. Janson et al. studied 106 athletes who were international, national, or club level players in technically demanding sports (20 archers, 50 golfers, 17 ski marksmen, ten min-golfers, six rifle marksmen, two discus throwers, and one boxer). In this study, researchers found that pre-release tension in international athletes was significantly lower than national or club athletes. Overall tension was also lower in international athletes than national or club athletes. Specifically, when the researchers measured the flexor digitorum and the extensor digitorum, the national and club athletes had unnecessary muscle tension while the international elite athletes had less tension. This was particularly true in the analysis of the golfers, archers, and marksmen. The flexor digitorum and the extensor digitorum are located in the forearm and hand and control finger movement back and forth. This, of course, would indicate the level of tension directly related to movement of the hand, wrist, and forearm. Tension is increased with the introduction of stress. Stressful situations are the key to understanding the importance of psychophysiology. When stress or anxiety is introduced, the physical game of athletes can change, impacting the quality of execution during critical competition moments in particular. Specifically, when one is stressed, the physiological response is shallower breathing. Yoshifumi and Hiroshi (2010) released a study of six male professional golfers and five male novice golfers this past December. These researchers explored baseline putting under normal conditions as well as the physiological changes brought on by the introduction of competition anxiety. Stress was induced by adding a small audience and a monetary reward for performance. The addition of stress provoked a reduction of the height of the backswing for the golfers. Moreover, forward club speed decreased for both amateurs and professionals in the pressure situation. Finally, heart rate averages under stress increased by ten beats per minute as compared with the normal baseline. From these studies, it is clear that anxiety causes changes in body tension as well as breathing patterns. Moreover, elite athletes have breathing patterns that emulate a heart rate deceleration prior to action. Heart rate deceleration is linked to performance quality. To improve one’s physical execution, the importance of breathing can’t be over-stated. Breathing and physical execution quality is impacted negatively with the introduction of a stressful situation. Accordingly, a purposeful breathing protocol added to the three-point targeting process will dramatically improve accuracy and repletion quality by keeping the individual bowler more focused which will reduce body tension and promote heart rate deceleration. Eight men from the Webber International University bowling program participated in the study. Each player has been trained in the three-point targeting with quiet eye system and utilizes it as part of their targeting process. Look at the focal point and take a long deep breath. Hold the breath for a full second. Exhale fully. After the exhale, move your eyes to the front target (arrows, dots, or foul line). Take another breath while looking at the front target. Keep your eyes on the visual front target and go. As you throw, you will exhale. The U.S. Open pattern was used in this study. The U.S. Open pattern is a flat 1-to-1 ratio lane pattern and one of the most difficult ever designed. Table 2 presents data illustrating the impact of the pre-shot breathing process. The data represents the specific improvement in consistency of boards and angles. A higher number represents a larger improvement while a negative number reflects a decrease in improvement. As you can see from the table, the breathing process helped the bowlers see immediate improvement in consistency, especially at the breakpoint. A positive value represents an improvement in consistency by a number of boards or angle. The biggest improvement area with the utilization of the new pre-shot breathing and targeting process was breakpoint consistency, with an average of 4.4 boards of improved consistency over ten shots. Six of the seven improved their accuracy in the front part of the lane, with an average improvement in consistency of .79 boards at 15 feet. The extended breathing protocol obviously aids in reducing the bowler’s heart rate. Exhaling when throwing mirrors what elite athletes do in regard to heart rate deceleration. Both result in reduced tension just before and through the point of execution. Finally, taking deep breaths while targeting the focal point and front target also ensure that the bowler employs a quiet eye. Heart rate deceleration, reduced body tension during execution, and an enhanced quiet eye are contributing factors to excellence in shotmaking. When a bowler has a pre-shot routine, with breathing described above, it will improve the likelihood that the bowler will make a better quality shot when it matters most. Specifically, when stress and anxiety associated with a key moment lead to shallow breathing, heart rate increases, and physical game tension, this extended process will help bowlers execute better shots, time after time. Carlstedt, R. (2001). Ambulatory Psychophysiology and Ecological Validity in Studies of Sports Performance: Issues and Implications for Intervention Protocols in Biofeedback. Biofeedback , 29 (4): 19-23. Davis and Sime (2005). Toward a Psychophysiology of Performance: Sport Psychology Principles Dealing with Anxiety. International Journal of Stress Management ,12 (4): 363-378. Neumann, D.L., Thomas, P.R. (2009). The relationship between skill level and patterns in cardiac and respiratory activity during golf putting. International Journal of Psychophysiology. 72: 276-282. Yoshifumi, T. & Hiroshi, S. (2010). The influence of audience and monetary reward on the putting kinematics of expert and novice golfers. Research Quarterly for Exercise and Sport 81 (4): 416-424.